A quiet get-away on the St. Joe River! This two bedroom home with central AC and clean, comfortable accommodations is under 2 hours from Chicago. 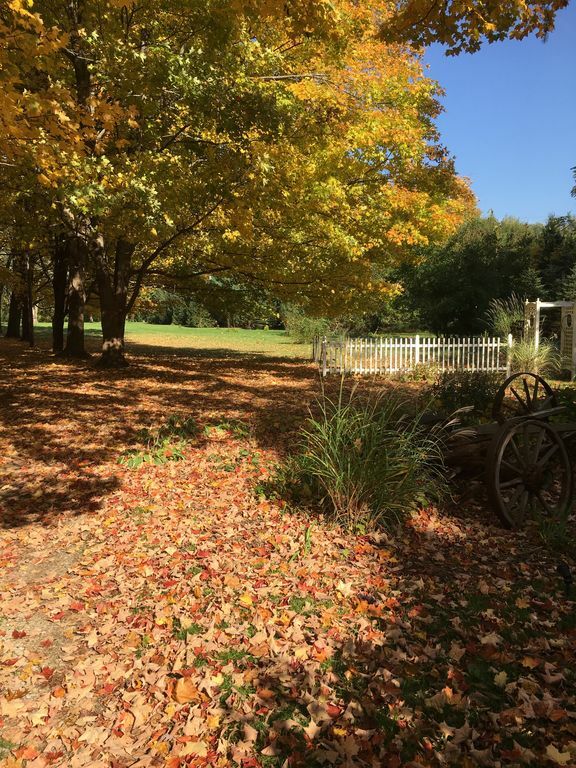 Along the St Joe River, this wooded setting on 10+ acres is great for a relaxing retreat or fun with friends and family. The river is easily accessed from a nature walking trail through the wooded property or enjoy the view from the screened porch. Bring your fishing poles, tubes or Kayaks. 15 minutes to downtown St. Joe, award-winning Silver Beach, and Harbor Shores Golf Club and many other fun distractions. The Cottage sleeps 4 with one queen and one full bed. There is also a pullout sofa. Fresh linens and towels are provided. This cottage is a real charmer. The setting feels remote, but you will have easy access to shopping, enjoying downtown St. Joe and the arts district in Benton Harbor. Awesome beaches, antiquing, winery tours, restaurants, barn sales, golfing are all close by. Some of the best fishing is right at your doorstep. Great spot to enjoy a good book, play games, hike, fish, etc. Please note that we require a 3 night stay over holiday weekends. We moved here full time after retiring in 2014. We live in another home at the far end of the property, so we are here if you need anything, but far enough away to ensure your privacy. We love the beautiful and serene nature that the property offers and know that you will love it as well. The main house was built in 1939 and we are its third owners. We first bought a home next door and got to know the previous owners over time. When they chose assisted living nearby, they offered to sell us this property which we so loved to visit. We were enthralled with the setting and how remote it felt while offering easy access to everything we need. We truly enjoy its proximity to Chicago where we visit family and friends often. Secluded peace and quiet with loads of wildlife, comfortable central air and heat, clean and functional living spaces, large eat-in kitchen with plates, flatware, serving pieces, pot/pans and cooking utensils, washer/dryer, near a great many fun outdoor activities, attractions, shopping, local events and festivals, winery tours, farm stands and antiquing! toilet, combination tub/shower, tub, shower, Great Shower Pressure. The bathroom is well appointed, spotless and sits between the two bedrooms. Lots from which to choose. Great location to visit wineries. Hosts were very responsive. Great place! What a great place to stay for a weekend getaway; off the beaten path, but close to so many fun places!!! Mike and Joe are amazing hosts who make you feel at home as soon as you pull in the drive with a welcome sign just for you. They leave essentials of sunscreen and bug spray on the table and chocolates on the bed. The extremely clean house is tucked back in the woods and a path to the river; all offering a peaceful sanctuary. I highly recommend staying at this gem!!!!! The little cottage in the woods was exactly what we were looking for. Mike and Joe has this place set up like home. The view to the river is beautiful while sitting by the camp fire. The cottage is secluded wrapped by woods which allowed the dogs to run free with no worries. From the moment we seen setting and the sign welcoming us, we knew we would be back. We enjoyed our stay at the "Cottage in the Woods." The home was tucked back in the woods and was very quiet. The hosts had everything ready for us including a welcome sign with our names on it. The home was very clean and well kept. About a 20 minute drive to the local beaches. We spent 5 wonderful days here with our two kids under 3. The cabin is far enough from town to feel secluded, but it is really just a quick trip across town from all the attractions of St. Joe. The owners are extremely accommodating and friendly and the place is super cute and homey. The kids enjoyed nightly walks down to the river. With littles, we loved the onsite laundry and comfy furniture. While you’re in town, please do yourself a favor and try the Mason Jar restaurant —delicious farm fresh food and super friendly staff that rivals any big city place. Silver Beach Pizza is excellent. Silver beach itself is clean and fun for the family. Tiscornia Park right next to Silver Beach is lovely and much less populated. The kids loved the carousel and curious kids museum on the one rainy day we had while here. We all had a wonderful time and you will too! - peaceful, rustic and near all the places we wanted to go. It was great to be able to walk down to the river. Hosts were easy to reach and we didn't have any issues at all. Enjoy all that S.W. Michigan has to offer: great beaches, golf, fishing, antiquing, wine tasting, etc. Special Offer: Please call 312 315 5333 Cancelled reservations are charged a fee. Fees will vary depending on our ability to rebook. We will work with you to apply fees to future stays.